Ongoing UCL Constitution Unit research is exploring options for an English Parliament. The choice of location would have major practical implications, as well as being of high symbolic importance. Jack Sheldon (UCL Constitution Unit) sets out the factors that would need to be considered. He suggests that while a ‘dual mandate’ English Parliament would almost certainly meet at Westminster, a separately-elected body would most likely be located outside London. Many proponents of an English Parliament would like to locate such a body at Westminster, given its pre-Union history as the home of an English legislature. Leaders of the Campaign for an English Parliament (CEP) have indicated a preference to ‘re-establish London’ as the English capital, with ‘Westminster as the English Parliament’ and the UK parliament moving elsewhere. Various other proposals for an English Parliament also envisage it being based at Westminster. Frank Field, Lord Salisbury and UKIP (in their 2017 manifesto), have all proposed a separately-elected English Parliament that would ‘cohabit’ with the UK parliament, filling a space created by the abolition of one of the existing UK chambers. Meanwhile, the leading proponent of the dual mandate model, John Redwood, has stated that he envisages an ‘English Parliament at Westminster’. This does seem strongly implied by the model, although another supporter, Andrew Rosindell, has suggested that a dual mandate English Parliament might instead meet in the City of London. Various proponents would instead like a separately-elected English Parliament to be located outside London. A notable call for this came from the singer-songwriter Billy Bragg, who argued that ‘[a] devolved England cannot flourish in the hothouse atmosphere of Westminster’. The case for locations outside London is often framed in terms of a desire to use an English Parliament as a means of reorientation away from a currently dominant London. For example, academic James Dennison has suggested that such a parliament could be located in the North of England, ‘thus moving the centre of British political gravity closer to the Scottish border and perhaps offering something of a reset button for Britain’s current political discontent’. In responses to our public consultation Manchester and York were the most popular suggested locations outside London. However, a whole range of possibilities were proposed, including major cities such as Birmingham and Leeds, as well as smaller cities with historical claims such as Lichfield and Winchester. In considering the location of a dual mandate English Parliament a key practical issue is that members would serve simultaneously in the UK House of Commons. The European Parliament, which uses chambers in both Brussels and Strasbourg, provides a precedent for the same politicians meeting regularly at two different sites. But this arrangement is widely criticised as expensive and inconvenient. Similar issues would be raised if the members of a dual mandate English Parliament had to shuttle between different venues. It would therefore seem altogether more efficient for a dual mandate English Parliament to meet at Westminster, as envisaged by John Redwood. For a separately-elected English Parliament an obvious practical issue is the need to find a building large enough for approximately 300 members, plus staff and other parliamentary facilities. There are few, if any, existing buildings aside from the Palace of Westminster that would be able to do this without substantial modification. Yet the possibility of sharing Westminster with the UK parliament would come up against practical difficulties. Aside from the obvious major obstacle of abolishing the House of Commons or House of Lords there would be many issues relating to the sharing of facilities between two bodies with different jurisdictions, political leaderships and budgets. Given that ministers would frequently be required to attend the legislature, an English Parliament outside London would require the head offices of English government departments to move from Whitehall. Accommodation would hence need to be found not only for the legislature, but also for government departments and the English First Minister. Such a project would clearly involve considerable expense and be prone to delays and cost overruns. Nonetheless, as demonstrated by the successful delivery of the London Olympic Park, major projects can be delivered satisfactorily with vision and investment. As noted above some have argued that it is the UK parliament which should be relocated outside London, with the English Parliament taking over Westminster. However, this would be hugely disruptive, requiring suitable new accommodation for the legislature, UK government departments and the UK Prime Minister to be found. Practical factors such as these would clearly need to be taken into account when making a decision on location. However, as the last point already indicates, symbolic considerations would probably be at least as important. This has historically been the case where new legislatures are established, in the UK and elsewhere. Following establishment of an English Parliament, who controlled the Palace of Westminster and other iconic institutions such as Downing Street would be highly symbolic. If the new body met at Westminster with the UK parliament moving elsewhere this would no doubt be celebrated many English Parliament supporters as a ‘reclaiming’ of Westminster as English. But it would undoubtedly be met with hostility from others. A particular concern would be the implication that the UK parliament had been usurped as the UK’s predominant parliamentary institution. If UK MPs appeared marginalised, and the English Parliament dominant, this could drive support for nationalism in Scotland, Wales and Northern Ireland. The possibility of cohabitation at Westminster between the UK parliament and an English Parliament also raises symbolic issues. Locating the two parliaments under the same roof would likely create barriers to the emergence of a distinct English political sphere. Members of the English Parliament would be absorbed into Westminster’s existing culture, sharing facilities and meeting regularly with members of the UK parliament. It is likely party organisation, pressure group interaction and media coverage would remain intertwined. Hence an English Parliament that cohabited at Westminster might struggle to emerge from the UK parliament’s shadow, and the public may struggle to distinguish between the two bodies. In deciding where to locate an English Parliament if not at Westminster symbolic factors would clearly also be at play. As we have seen, cases would be made for some locations, particularly large cities in the north of England such as Manchester and Leeds, on the grounds that this could help counter the UK capital’s political and economic dominance. Meanwhile, cities that were prominent in pre-Union English history such as York and Winchester would be promoted as symbols of an English political renaissance. Various alternative suggestions have been made for the location of an English Parliament, but there is no settled view among supporters. 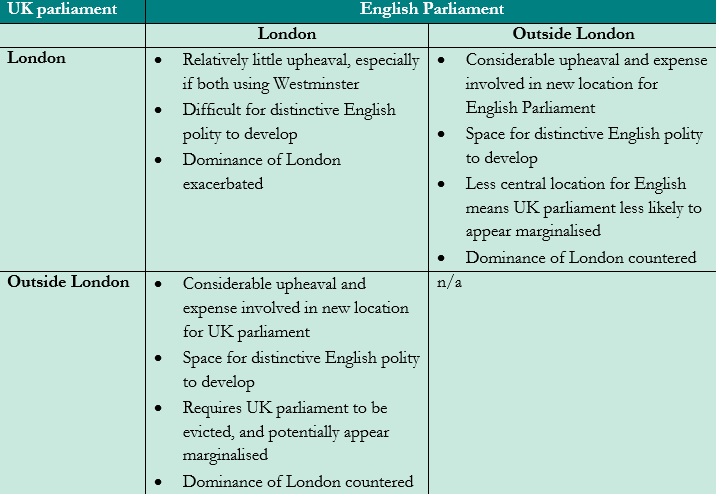 The practical and symbolic considerations discussed above (for a summary, see the table) suggest that a dual mandate English Parliament would almost certainly meet at Westminster. There is less certainty about the location of a separately-elected English Parliament, but on balance symbolic factors make it most likely that it would be located in a city outside London, despite the practical issues this would raise. Choosing where exactly a separately-elected English Parliament should be located could well prove divisive. Many cities would have strong claims and the choice of a location in one part of country could be unpopular elsewhere – for example Manchester or York might feel even more distant than London for people in the South West of England. One way of alleviating such tensions might be through holding a national competition. This could take the form an ‘Olympic-style’ bidding process where different cities proposed sites, including new or existing buildings. These could be assessed by a judging panel of distinguished individuals against agreed criteria. While the judging panel could make recommendations, and public consultation would be essential, the ultimate decision would be for government and parliament. This post represents the views of the author and not those of Democratic Audit. It first appeared at the UCL Constitution Unit blog. The UCL Constitution Unit’s detailed report on Options for an English Parliament will be published in early 2018. Jack Sheldon is a Research Assistant at the Constitution Unit, working on the Options for an English Parliament project. He is also the editor of the Constitution Unit blog.